You swing your basket full of treats as you trot down one of Singapore’s many parks, eager for a nice afternoon picnic with your group of merry pals. After hunting for ground, your group finally claims territory under the shade of a tree. You lay out your mat, drinks and snacks, but before you can dig in, a colony of ants have invited themselves to your party. Battling between swatting bugs away, dabbing your sweat off and enjoying your friends and food, you realise that the sun has decided to come out and greet the world with its hot and glaring rays. If only you could enjoy the outdoors without having to actually deal with the outdoors. A picnic with air conditioning would be a dream – and this upcoming dining experience is making our wishes come true. Local company AndSoForth, which organises larger-than-life dinner parties, is back with a laid-back installment that’s never been seen in Singapore. Its latest production, The Picnic, promises all you ever wanted in the perfect picnic without the sticky humidity and assaulting insects. 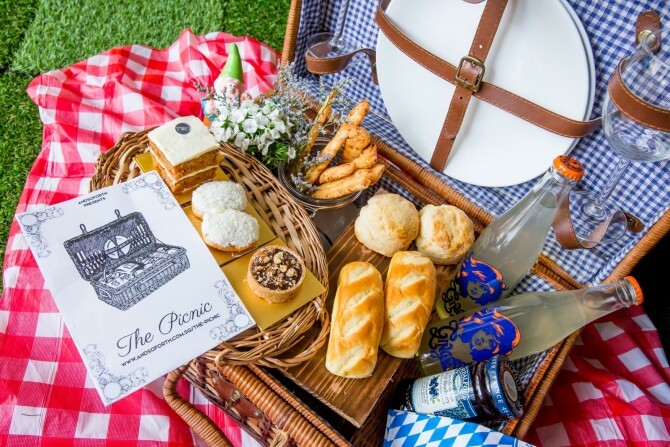 Set in a secret location, The Picnic touts the complete outdoor experience, from beautiful weather conditions to a lush green lawn – all indoors. This multi-dimensional art installation will be Singapore’s First Indoor Picnic. It will run from three weekends starting Feb 13. There are three timeslots, each coming with its own basket meal: Hearty Lunch (11am-2pm), Hi-Tea (3pm-6pm) and Extra-Booze (7pm-10pm). The Picnic costs $68 per person, and if you’re planning to take your Valentine’s there, tickets for Feb 14 are going at $78 per person. The Picnic will run for three weekends from Feb 13. More information here.